Wednesday 7:30-9 PM, CSRI 7 Ross Ave San Anselmo, Ca. Beginner Belly Dance classes are geared for the casual or serious student. Focus is on learning the fundamentals of belly dance isolations, dance footwork,and rhythmic identification. A comprehensive belly dance vocabulary including steps, turns and transitions. Intermediate Classes Tuesdays 7:30-9PM are directed to dancers who are familiar with Middle Eastern Dances and Terry's technique and dance vocabulary. Musical understanding, props, finger cymbals and performance elements are presented . This class periodically has musical accompaniment from Marc and Ling Shien Bell of Helm. 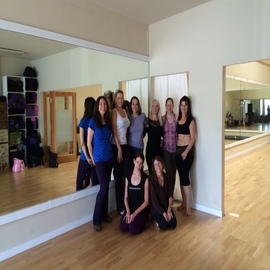 Classes held in San Rafael, Ca. Advanced Classes Saturday 11:30-1PM are geared for long term student who has a comprehensive understanding and familiarity with Terry's repertoire and dance vocabulary. San Rafael, Ca. Terry's teaching style is inclusive of everyone from the casual or serious student to the working dance professional. There is no certification program for her curriculum. After steady attendance and regular practice beginning students are encouraged to attend advanced classes. There is no "troupe class" or performance only class. However performance-ready and or interested students are provided opportunity to perform at student showcases. Please feel free to contact Terry by phone or e-mail with any questions about classes or workshops. Private lessons are also available.